Do you have a loved one nearing the end of their lives due to advancing age or a life-limiting illness? While it is a blessing to share time with your loved ones at the end of their lives, the emotional strain for everyone can be overwhelming. Making the decision to find hospice care is just another hard choice that must be made, but making the decision will make your loved one’s end of life experience much more comfortable and pleasant. Hospice care can be offered at an inpatient hospice facility or in-home hospice can be offered for those more content with passing on in their own home. Finding a supportive, professional, caring, and reputable hospice organization does not have to be a difficult task. 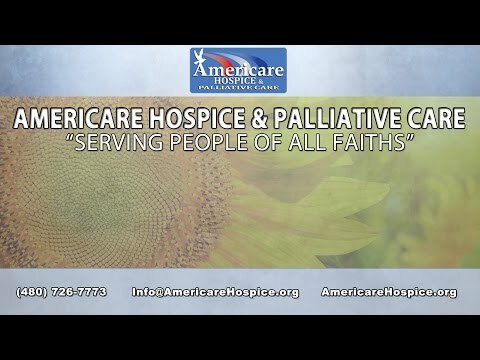 Americare Hospice and Palliative Care in Mesa Arizona is the faith-based life transition organization that can give your loved one the care and respect they deserve during this difficult time. Deeply values ethics that protects the value of human life. Spirituality is often very important to religious people nearing the end of their life. Despite our individual beliefs and understanding, it is crucial that a patient can fight for a cure for their illness or pass on in a manner that coincides with their religious or spiritual affiliation. Respecting a loved one’s wishes near the end of their life is important, whether it is a spiritual accommodation or a different non-religious request. The core of adequate care is respectful, kind, and validating relationships with nurses, caregivers, and loved ones. A Tempe hospice facility with a strong philosophy of real care is incredibly important, whether it is within a facility or in-home hospice. Pain management and spiritual care are vital elements to successful hospice care. An approach that is ethical, morally clear, and supportive of natural processes is also very important for fulfilling end-of-life care. Holistic practices often make the process of passing on more of a beautiful process. Additional support for the patient’s caregivers and family struggling with grief and mourning makes for a great hospice facility as well. Americare Hospice and Palliative Care believes in integrating pain and symptom relief with spiritual respect and fulfillment that communally involves not just the patient, but the family as well. For quality and compassionate hospice care near you, contact the patience care professionals at Americare Hospice in the 85281 and 85282 areas in Tempe. When you need skilled and compassionate care for your loved ones in the Tempe areas of 85283 and 85284, trust Americare Hospice & Palliative Care.